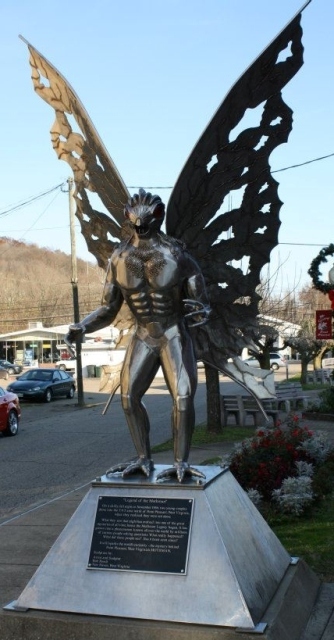 The Mothman Revealed: West Virginia Embraces its Extra-Terrestrial Visitors! 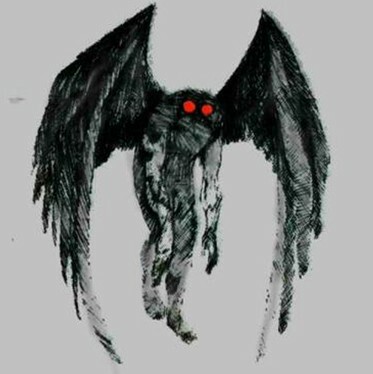 From Wikipedia: Mothman is a legendary creature reportedly seen in the Point Pleasant area of West Virginia from 15 November 1966 to 15 December 1967. The first newspaper report was published in the Point Pleasant Register dated 16 November 1966, entitled “Couples See Man-Sized Bird…Creature…Something”.. 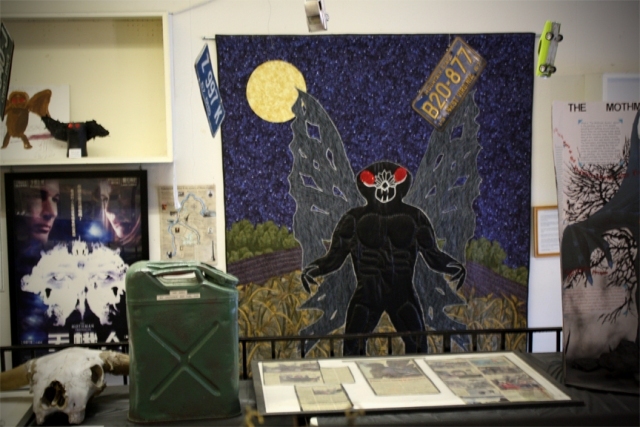 The Mothman Museum – This is the 3rd time I had stopped in Point Pleasant WV to see the Mothman on my way to Horrorhound Weekend. I grew up about 3 hours away from Point Pleasant, and never heard about the legend of the Mothman. 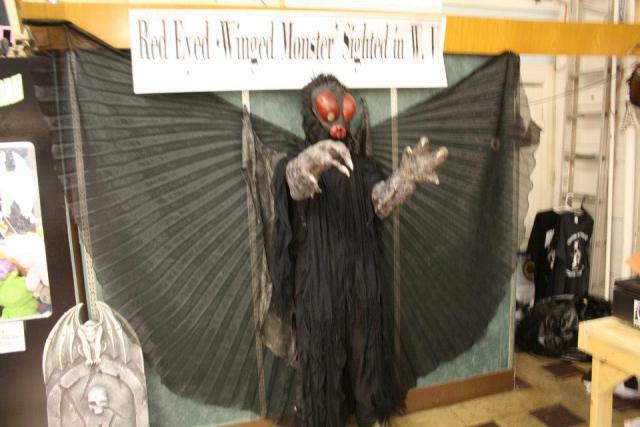 My own town had tons of folktales and legends, but the Mothman was not one of them. So when the Mothman Prophecies came out I was fascinated with the legend, So in the fall of 2008 I made the trip to see the Mothman. I love crypto zoology stories of Bigfoot, aliens and the Chupacabra, so the Mothman was right up my alley. 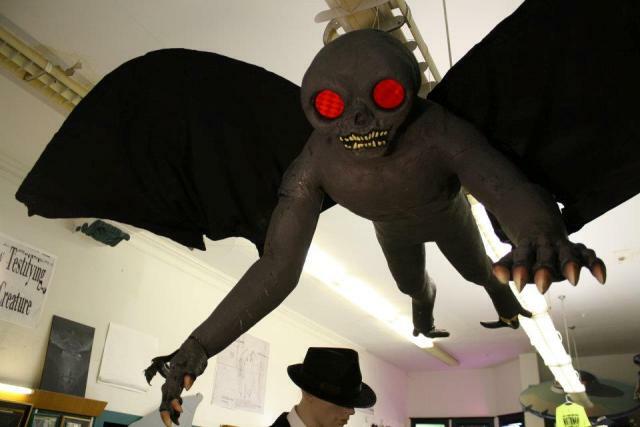 As you enter the museum, the Mothman hovers overhead! 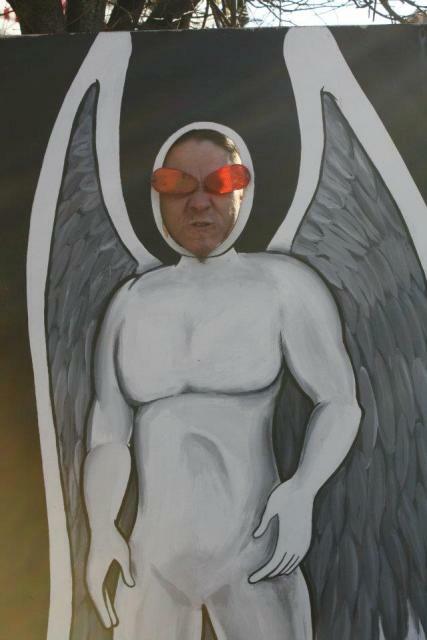 On this most recent trip I took my friend Scott down to introduce him to the Mothman. Ever since the film came out, visitors from around the world started a type of pilgrimage to the see this legend. 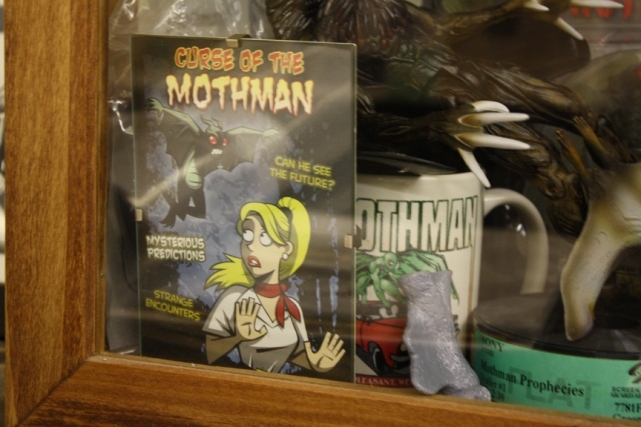 This inspired local author Jeff Wamsley to establish the Mothman museum in the heart of downtown Point Pleasant. I believe the local town was not too crazy about drawing attention to this aspect of their town, but once the tourists showed up , the town quickly took notice. Now the downtown has life-size Mothman statue, the museum, a gift shop, and an annual fall festival with everything from Mothman Pancakes, Mothman Frappachinos, and even a Miss Mothman Beauty Pageant. 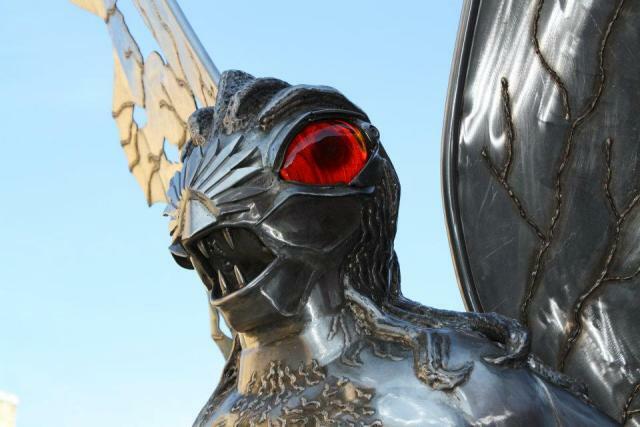 A close-up of The Mothman! 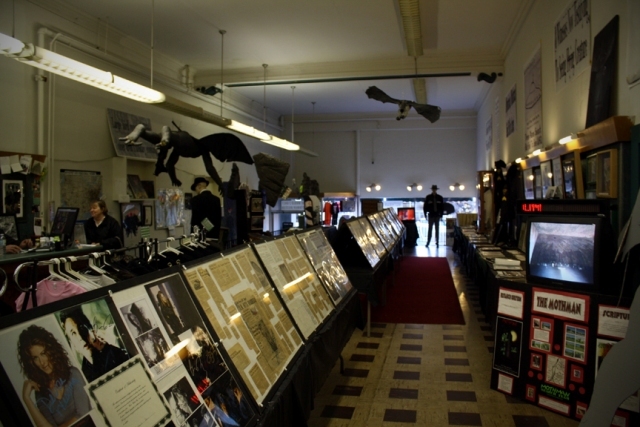 The Museum is an archive of Mothman related articles and signings! 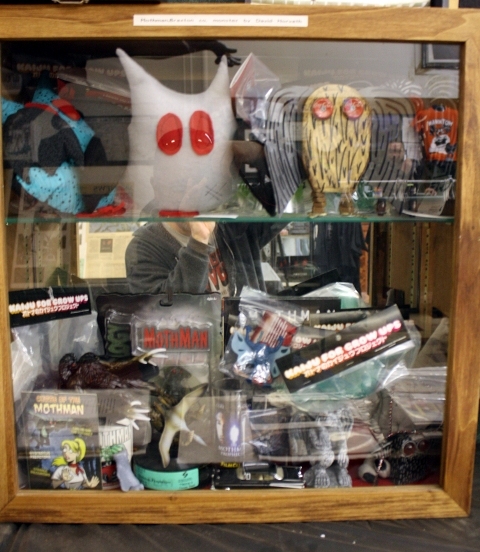 Collection of Mothman related items! My artwork has made it into the Mothma Museum! This entry was posted in Cryptozoology, UFO, Weird USA and tagged ALIENS, Brian Maze, Mothma Museum, Mothman. Bookmark the permalink. ← Brookfield Zoo’s 2011 “Creatures of the Night” Unearthed!